No European vacation is complete without a day spent off the beaten path. Here are a few day trips to consider (and how to include them in your own itinerary). Planning a trip to Europe is much more of an undertaking than say, planning a beach vacation. First of all, you'll need to get a passport if you don't already have one. Once you do, you'll have to make peace with the high price of international flights and hotels. Meanwhile, you'll need to settle the gritty details before you arrive; your hotel reservations, train tickets or transportation arrangements, and of course, the financials of the entire thing. But once you get those particulars figured out, you're still not done -- you have to strategize what you will actually do once you arrive. If you're planning to visit bigger cities like Rome, London or Barcelona, Spain, you probably have a list of sights to see first, and perhaps you'll want to spend time shopping or noshing on the local cuisine. But those aren't your only options. No European vacation is complete without a day spent off the beaten path. Here are a few day trips to consider (and how to include them in your own itinerary). Rome is not short on its own historic attractions, but every visitor to this city should make time for the ruins of Pompeii. Sitting just beyond Mount Vesuvius, Pompeii was once a thriving city full of aristocrats. 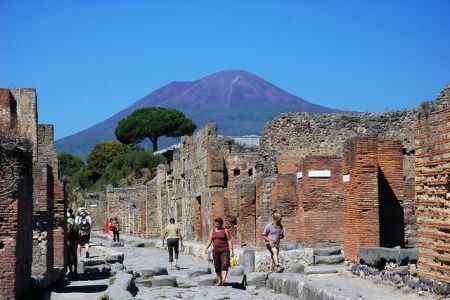 But the dangerous Mount Vesuvius sealed the fates of thousands of unsuspecting citizens when it erupted on Aug. 24, A.D. 79 and buried the city in ash. This trip, offered by City Wonders, will take you deep into the history of this bygone metropolis and up onto the mountain that destroyed it. The cost: about $152 USD per adult including lunch and luxury bus transportation. Dozens of day trips leave from central London, but one of the most prolific will take you to both Stonehenge and the historic city of Bath, England. Premium Tours offers hotel pick-up at more than 100 London properties and provides luxury bus transportation to both destinations for £65 (about $100 USD) per adult. The first leg of your journey will include a jaunt through the English countryside and a lecture on the origins of Stonehenge. How did it get there? What was its purpose? No one knows for sure, but you will be in awe upon seeing this striking earthwork enclosure. Next up is Bath, with its stunning architecture and English charm. Eat in an old cafe, shop for handmade treasures and take in the scenery before boarding the bus back to London. Storm the Normandy battlefields on your own history-themed day trip from beautiful Paris. Visit the Omaha Beach Museum and drive along both Juno and Gold Beaches where thousands of lives were tragically lost. End your journey with a visit to the Normandy American Cemetery and Memorial, where 10,000 American soldiers were laid to rest. If you're an American staying in Paris, this is one historical journey you should not pass up. This trip is offered through Viator and includes round-trip transportation and lunch. The cost: about $200 USD per person. You can't leave Dublin without a trip to the most famous fortress in all of Ireland -- Blarney Castle. Take in panoramic views of the Irish countryside, and explore both Cork City and Cobh -- the last place the Titanic departed from in 1912. Of course, you'll also want to kiss the famous Blarney Stone while you're there; doing so is said to guarantee you seven years of eloquent speech, or "The Gift of the Gab." If you want to visit all of these sites on a day trip, you can book directly with PaddyWagon Tours for less than $60 USD per person. The price includes transportation and admission into the historic Blarney Castle and gardens. A scenic tour through the Swiss Alps is a must if you're in Zurich. City Discovery offers a summertime coach tour over the Brünig Pass and through the Bernese Oberland where you can walk through the Aare Gorges unassisted. Take in the spectacular scenery as you head toward Rhone Glacier and the stunning Furka Pass. Walk through a blue ice tunnel and ascend Devil's Bridge before returning back to Zurich. The cost of this trip: less than $170 USD per person, including transportation. About the author: Holly Johnson is the founder of travel website, Travel Blue Book, which covers travel experiences ranging from cruising to fine dining. Holly also writes about frugal living, travel and budgeting on her other website, Club Thrifty, and at Get Rich Slowly, Frugal Travel Guy, Personal Capital and many other online publications.